You’ve been working in psychology for 60 years now and are well known for your research on personality, child development and self-control. What got you interested in psychology in general and more specifically these areas? I was born in Vienna in 1930 not all that far from Freud’s house. So even as a young child I was aware of his presence, and I suspect at some level I became quite interested in what makes people tick. In 1938 the Nazis took over Austria and we had to get out of Austria alive – which was not easy to do. But we managed it and we left pretty much without anything. We had to begin all over again. As a child in the United States, my family lived under conditions of poverty. It’s not that we were starving – we had enough to eat – but not much else. A few years later, as an adolescent, I became increasingly interested in reading about psychoanalysis, which was all the rage at the time. Remember, we are now talking about the 1940s when psychology was very different. As I was going to college I worked as an uncredentialised social worker with kids at the Lower East Side of New York, which was at the time an extremely impoverished area. They were living under very difficult conditions. So my interests in psychology really began as I tried to apply the work I was reading about to these troubled adolescents. This was still within a psychodynamic perspective. There was one evening I remember vividly when I was surrounded by a group of adolescents and was speaking to one who had a brother who was in the New York state penitentiary awaiting execution. So obviously this kid had lot of issues to deal with. I started to talk to him and attempted to make an empathic connection with him. I thought I was doing very well, surrounded by these kids as I made use of my newly developed knowledge and empathic skills. Then I smelled smoke and realised that the back of my jacket had been set on fire… a rather dramatic awakening to the limitations of my attempts to change the lives of these adolescents. It made me realise I had a lot to learn. And that experience really led me into psychology. I think that was the moment when I really wanted to become a psychological scientist and to make some sort of impact on young people. I think this is an important part of my personal story of why I got into psychology. Were there any teachers or mentors that particularly influenced you? Very much so – after the experiences I’ve just described I went on to graduate clinical work in psychology at Ohio State University from 1953 until 1956. Two mentors at the time had a huge influence on me. 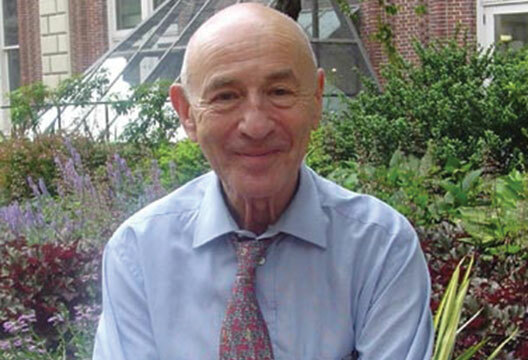 One was Julian Rotter – who was very much the originator of the idea of social learning – he wrote an important book on social learning called Social Learning in Clinical Psychology. He died earlier this year aged 97. I went on to do my PhD with him in the mid-1950s and he had strong influence on my thinking because his focus was that social learning makes an enormous difference. We can change not only what we know but how we think as well. The other major influence, especially in my clinical work, was George Kelly. He had an enormous personal impact on me with his theory of personal constructs. He was very much of the view that you can’t change what nature does. So if I break my leg there is a reality about it – you can’t walk on it – but how you think about it can change. You can change how you perceive and construe it. I can think about it as a catastrophe – ‘I can’t ride a bike now or even walk’ – or I can see it as an occasion to catch up on books I have long wanted to read, and so on. Events happen, the freedom we have is to change how we think about them. I think this had a profoundly important influence on my own thinking and development of my own interests. How cognition can change experience and what the role of thinking is in how we deal with impulse control. So the two sides of my work began to come together. These themes remerge in your new book The Marshmallow Test: Understanding Self-control and How to Master It. For any readers not familiar with your famous test, can you outline it and how you came up with it? It’s simplicity itself. I saw the tremendous change in my own three daughters who were three, four and five at the time when I was beginning my professorship at Stanford University. I became interested in self-control as I saw them evolve from what newborns are to thoughtful, reflective individuals with a lot of control. My burning interest became how does that transition work? Clearly it involves changing from being relatively uncontrolled to becoming able to control oneself. So I wanted to develop a measure to capture this phenomenon. After lots of experimenting I came up with a very simple situation where the child has the choice of some attractive compelling thing that he or she really wants – it doesn’t have to be a marshmallow, it can be a cookie or a stick pretzel. It just has to be something they really want. Then the question is ‘Would you like one or would you like two?’ They invariably choose two. Then the contingency question is ‘You can have these two if you wait for me to come back or at anytime you can ring the desk bell right here in front of you and I will come back and let you have the one marshmallow’. So that’s the methodology – a methodology you can eat! I’ve seen this on film many times and they vary a lot in response – I recall one little boy who popped the marshmallow in his mouth as the experiment was being explained to him! Yes they do vary a great deal. Some do that – but there are others who really can delay this response. And in watching them we saw the sort of mechanisms they were using to delay gratification. Then the research went from just observing how different kids deal with the situation to doing controlled experiments with it – where we suggest ways in which they can delay their response. Going back to Kelly it is very much a case of thinking differently about the marshmallow. If you think about it as something delicious and chewy, invariably they consume it within a minute. This is thinking ‘hot’ about it. But if you give instructions to them to think about the marshmallow differently – such as a fluffy cloud or a little tiny cotton ball – then children have a very easy time delaying gratification. So what we have here is a demonstration of Kelly’s idea that the way you construe a stimulus determines how you respond to it emotionally and cognitively. It’s really direct observation of how children manage this that led us to understand the sort of strategies that they develop – strategies of self-distraction. Some children are able to deal with the situation by turning away from the marshmallow so they couldn’t see it. Others would talk to themselves and give themselves instructions, or they pretend that they are putting it in their mouth but don’t. They engage in a whole set of strategies that allowed us to systematically test the mechanism that underlies the ability to use self-control – to fundamentally cool the situation, to reduce the power of the marshmallow and to focus on the consequences, ‘if I don’t do this then I get that later’. So for those that are very poor at delaying gratification – you can teach them strategies to improve this? Yes – I think there are really two key points that come out of the early stages of this research. The first is that there are obviously large and important individual differences in how difficult this task is for some children but not for others. The second point is exactly what you are saying – there are cognitive skills that are teachable and there are a number of strategies that can be taught that make it much easier. Anyone within a normal range can learn these. This is very good news because it allows a much more optimistic view than the one that willpower is very much a trait that you can’t do much about. Does this link into your idea about our having two different systems – hot and cool? Yes, we have two systems that interact constantly in the brain. We can call these the hot system and the cool system. The hot system is the limbic system that is very important to us from an evolutionary perspective. On the savannah we needed immediate reflexive rather than slower reflective reactions. They saved our lives and got us to keep away from the things we needed to avoid, but also encouraged us to approach and take the things we needed (including the equivalent of the marshmallows). The problem is that in modern life there are many situations in which eating the marshmallows all the time results in, for example, very bad retirement planning. Where the current availability of things that you want enormously restricts how well you can delay gratification. Also we have to consider the complexities of emotional relationships. And it is difficult to resist a world full of alluring temptations like cigarettes and drugs and sugar-filled foods. These are all waiting to trigger our hot systems. I think the key, psychologically, is how to use the prefrontal cortex, which is the core of the cool cognitive system. How to make automatic, through practice, the kinds of strategies that are normally activated by the hot system. At that point we are not in a position to reflect on the long-term consequences of our actions – the possibility of heart disease decades down the line. The cool system allows us to regulate the emotional thermostat, so that in ‘hot’ situations our response is cooler and reflective rather than hot and reflexive. It helps to have if-then implementation plans so that when, say, the dessert arrives, I choose the fruit rather that fill myself with sugar. Not much psychological research passes into popular consciousness. Why do you think that the marshmallow study has had such staying power? Was it great research, or is there something in particular about it which captures the imagination? I’d like to think it is a bit of both! It wasn’t great research when I started. But I think what I started became great research by bringing others in from cognitive science and expanding it by concentrating on executive function. There is something fundamental that the prefrontal cortex does which happens to be captured by the marshmallow test. There are three important components here. First, you have to keep the goal in mind – ‘I want the two marshmallows’. Second, you have to suppress interfering responses – ‘I can’t let my hand ring the bell, I can’t think how chewy it is’. The third component is you have to use your attentional control system to find ways of both monitoring your progress to the goal and preventing interfering responses and doing whatever you need to do to allocate your attention to make it possible. That’s where imagination comes in. That’s where playing piano on your toes or distracting yourself or imagining the future consequences come in. So the fundamentals of it are captured by the marshmallow measure. I think that captures the imagination of people because they can visualise it and relate it to their own kids. It became a way to study executive function in many ways. Many people consider that the benevolent way that we bring up children in the West today means that we are shifting the balance towards a lesser ability to delay gratification. Turning to your work on personality theory in the late 1960s you developed a new way of thinking about personality. People generally subscribed to the view that we all have personality traits that are pretty consistent across situations. Then you developed the idea that a person’s responses are largely shaped by the situation? I think that this links in very closely with the fact that people who are very good at self-control – for example ex-president Bill Clinton who had a Rhodes scholarship, went to Yale, got a law degree and became president of the United States – can, at times, show less control. In all of these achievements he showed great self-control in achieving. At the same time he was not without areas where his self-control did not seem to be his dominant focus. It really is context-dependent. I think the hot system can be very useful because it simplifies and condenses lots of impressions into one single one. So we say Charlie is really highly conscientious whereas Sally isn’t at all. We make these easy generalisations and in fact one person is more conscientious if we aggregate everything together. But I think as scientists our job is to disaggregate things. When we do this we find behaviour is highly contextualised. In the studies that I have done with kids in a camp for six weeks, where we make 180 hours of observations on each child and we look at things like aggression, what we find is that the profile of aggression for one child with the same average level of aggression can be completely different to another. This is because one child might become super aggressive but when adults want him to take time out and away from other kids they may be far less so. In the case of another kid, they might be aggressive, but only when adults are around. So we find that a profile is stable over time but not consistent over situations. It’s a very particularised aggression – it is only shown if certain hot spots are triggered. That I think is where good science goes. It tells us that each of these kids has a problem with aggression – but one has a problem with other kids and the other has a problem with adults. Aggression is highly contextualised. They have different hot-spot triggers that lead to stress and to aggression in general. This is also true of conscientiousness, sociability and extraversion. I started by pointing out that you have been involved in psychology for 60 years now. You’ve had a very full career, but are there any ambitions you have yet to fulfil? My ambition currently is the hope that this book will make a difference to a lot of people. At the very least to help people understand how self-control is not something you either have or don’t have, but involves a series of strategies and mechanisms that can become automatic over time. That, to me, would be a great realisation. If it can be incorporated in very simple ways into the agenda at preschool level and into early education to help with some of the challenges we are faced with today, then that would be a real achievement.